Made with Diet Coke and sweetened with Agave, this drink is one of my top ten! This recipe was found after some serious digging on MakeMeACocktail.com. The ingredients not your standard four as tequila replaces whiskey, chocolate bitters replaces orange bitters, and coke is added (just a splash) instead of the standard water. I was excited about this option – as tequila is actually fairly simple to replace with agave syrup. I tested this recipe on my kids, my parents and a friend who wanted to join the tasting fun and in an effort to be scientific worked out the important of each ingredient by testing the mix starting with just Coke and bitters and then adding the agave syrup and finally orange to the mix. Interestingly, the agave syrup brings the chocolate taste to the forefront of the drink and lends some complexity to the flavour. This created a very nice “chocolate cola” but I wanted to push it one step further. As citrus and chocolate are commonly blended flavours, I tried muddling in a mandarine orange (skin and pulp) and adding just a dash of orange bitters back to the mix to bring back the element of citrus so common in Old Fashioned Cocktails. The result was something I am proud of. Muddle orange, syrup, bitters and water in cocktail shaker. Add ice and shake well to blend. Strain into two 6 oz glass full of ice and top cola. Stir and serve with a twist of orange as a garnish. This drink is reminiscent of chocolate orange candy. 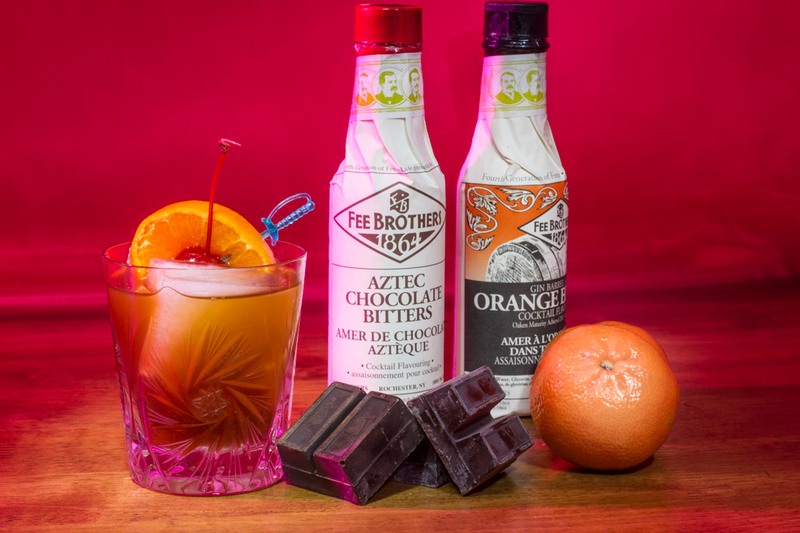 The cola lends well to the two flavours without being lost in the mix, and the addition of the orange bitters, while seeming negligible, brings out the orange of the mandarine to blend without competing with the chocolate. Not everyone like chocolate and orange together though – and the drinks without the addition of the muddled orange or orange bitters is also very tasty – just less sophisticated in my opinion. Other family and friends enjoyed both options, some preferred the chocolate alone with the coke and agave. Which to be honest is closer to the original concept of the Kola Old Fashioned. What did the kids think? My daughter thinks this should be called the Kola Miracle since it converts a simple Coke into something… well magical. Kid-o-metre 5/5 my kids love this, they finished off their testers and asked for more. Taste: 5/5 unless you don’t like orange and chocolate together and then, well… you’ll disagree. Ingredient finding: 2/5 mandarines are sometime seasonal, and the syrups require special order or specialty store purchases.